Digby started practicing Ashtanga Yoga in January 2001 with Mark Freeth, studying with Mark for 7yrs while also serving an apprenticeship in teaching during this period. He started teaching full time in 2005 and opened Stonemonkey Ashtanga Yoga Studio in 2009. 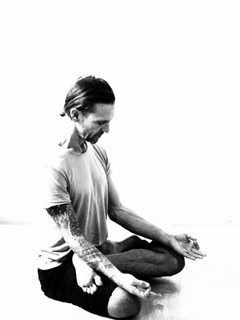 Digby has also completed teacher trainings & intensives with leading Ashtanga teachers from around the world and is recognised as a Senior Yoga teacher with Yoga Alliance UK. He is director & senior teacher at Stonemonkey ashtanga yoga studio and runs daily classes, beginners courses and workshops. Having practiced Ashtanga Yoga consistently for 18yrs, Digby’s love for this practice continues to grow. He regularly studies with inspiring teachers such as Hamish Hendry & Peter Sanson. Digby’s teaching over this time has evolved. He has developed a greater interest in making Ashtanga Yoga accessible to everyone, whatever their age or physical limitations. He is passionate about teaching the traditional self practice method. He encourages and supports people in developing their yoga practice including Asana (posture), Pranayama (breathwork), Chanting and Meditation. Digby loves to see his students develop their practice slowly over time and at a pace that suits their individual needs. Practiced with regularity, this system of Yoga has the ability to create positive change for the practitioner on all levels, physically, psychologically & emotionally. The morning sessions will consist of a mix of ‘guided self practice’ and led classes. The evening sessions will focus on pranayama & meditation with a short talk on philosophy and techniques in relation to Ashtanga yoga. On this retreat you will really feel the therapeutic benefits of Ashtanga yoga and equip yourself with techniques that will support you in their life. Everyone is welcome to join the retreat at Kailasam Yoga regardless of whether you are a complete beginner or a more seasoned practitioner.